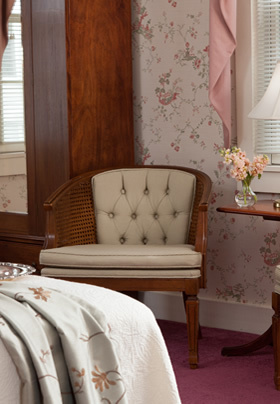 This Oriental-inspired room welcomes you to Martin Hill Inn with a plush king-size bed and wall hangings. Relax in one of the two armchairs, or sit at the antique writing table. This sunny corner-room also features a mahogany English armoire and flat-screen TV, as well as an en-suite bathroom with shower stall. 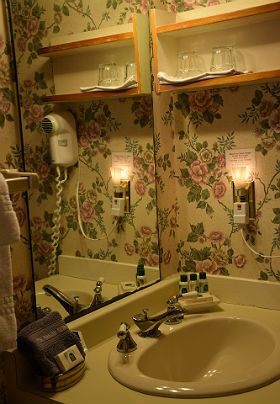 This room is located on the first floor of the Guest House. One of the most talked about ships of her era, Nightingale was an extravagant yacht-like clipper ship. Built in 1851, she weighed 1060 tons and was 185 ft. long. Her maiden voyage was supposed to go from the United States to London for the World’s Fair, but her building process was delayed due to financial difficulties. After she was launched, she was towed to Boston and auctioned for $43,500. She finally set sail in April of 1852 and began her 42-year career. She later went into the Australian merchant trade, doing the passage in just 90 days. Amenities: King Bed, Air Conditioning, Private Bath with stall shower, Wi-Fi, Flat-screen TV, End-table Refrigerator, Writing Desk, Sherry, Bottled Water, Chocolates, and Snacks. Minimum night stays may apply. Rates are subject to change.